Altered scores after heat-shortened games lead to punishment. 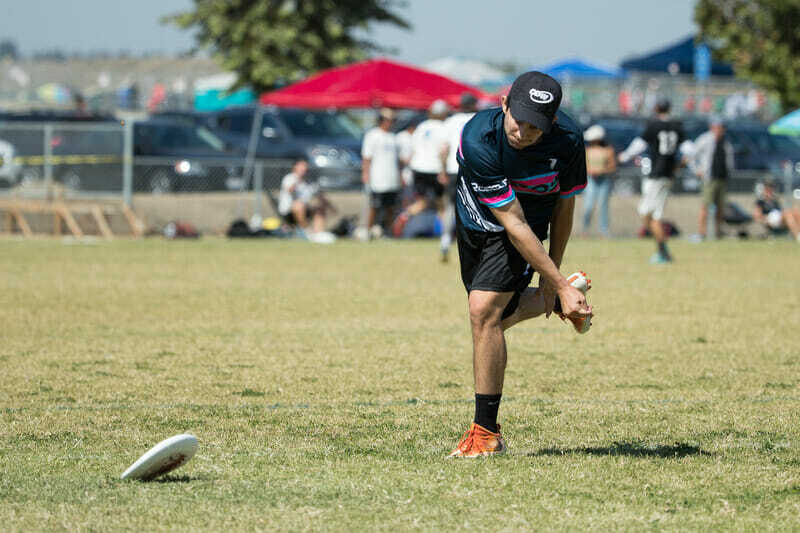 To the outside observer, the Southwest Mixed Regional Club Championships occurred without incident; the three bid-earning squads advanced to Nationals with convincing performances in their elimination games. On paper, the biggest story coming out of the weekend was Mischief sputtering on Saturday and slaying on Sunday en route to a tournament title. And while the tournament itself went very smoothly for an event with only three volunteers on hand during the weekend, there was an asterisk on the action. On Tuesday, September 18th, five days before Regionals was set to start, USA Ultimate sent an email to the captains of Santa Barbara Robots, Phoenix ROBOS, L.A. Family Style, and L.A. 7 Figures informing them that they would be unable to compete with their teams on Saturday. The captains would not even be allowed to set foot on the fields until Sunday morning. While the email may have come as a surprise to the SoCal captains, the cause for the sanctions was clear. On Sunday during Sectionals, all four teams had one final game. 7 Figures was set to play Robot; Family Style was set to play ROBOS. All four teams had already qualified for Regionals by this point: the final game was strictly to determine seeding. The temperature in Tucson, Arizona where the tournament was being held had already exceeded 100 degrees, and the heat index was threatening to match that during the round. Per USAU rules, if the heat index rose above 100, play would have to be suspended. The captains of the four teams were informed that they were allowed to continue under the current conditions or wait until 6 PM for the heat to dissipate.1 Because of the implications for Regionals seeding, the teams were alerted of the high temperature but told by staff members that they had to play their games, or at the very least wait until 6 PM before they could make any decisions about forfeiture. That put a strain on many of the teams set to play. Some had players whose flights were scheduled to depart before 6 PM while others were just worried about what time they would arrive home. The drive from Tucson to Los Angeles is more than eight hours — closer to ten for the players from Santa Barbara. Even if the players left immediately after their games, there was no chance they were returning home before 2 AM on Monday morning. And with most players working the next day, it was ruled out of the question. The teams chose to play their game during the heat of the day, but, as they were warming up, it became clear that the temperature was having an adverse effect. Injuries had shortened rosters, and cramping was a factor for many players even before games had begun. But the games still proceeded as planned. It only took a few points for teams to decide that they felt it was unsafe to continue. 7 Figures and Robots agreed to retroactively set the starting score to 8-8, so as to finish a ‘full game,’ while Family Style and ROBOS simply ended their game at 4-3. The saga was only just beginning. Thinking they could be disqualified from Regionals, the ROBOS and Family Style captains agreed to change the score of their game to 11-10. Similarly, 7 Figures claimed a 13-9 win, even though they had only played six points. This was a problem for the same reason that forfeiting their games would have been a problem. USAU and the Southwest Regionals tournament directors rely on Sectionals for help when seeding teams. Shortened games can impact that seeding process. But altering scores is never acceptable with USAU, as the teams would soon find out. Making matters more complicated was that the games never even needed to be played. “It was especially disappointing to learn that the games did not have to be played, as the TD had misinformed all teams about the rules and potential consequences of not playing the games,” said 7 Figures captain Chris Feeney. But the games did start, and the teams took Eia’s statement to mean that they needed to report scores that appeared to show the completion of a full game. As they were not directly involved, the tournament directors did not have a full understanding of the events that led to this miscommunication but were adamant that they did not tell their staff or any captains that altering their game’s score was acceptable. “From [our] understanding, the problem was the teams wanted to play the game and started, then after a few points changed their minds and reported the current score, then, likely because of what they were told, changed the score to make it sound like a full game,” said the tournament director Tim Wood. The teams emphasized that player safety and returning back home in time for the workweek were their chief concerns; otherwise, they would have finished their games. The intention was not to cheat or game the system but to look out for the players on their team. But after being told that reporting an incomplete game could result in a disqualification, they quickly corrected their scores to match that of a full game, believing that to be what the tournament staff had asked of them. When USA Ultimate found out about the score alterations, they discussed the situation internally and decided to apply sanctions. “The decision was appealed by the teams and the Judicial Committee upheld the sanctions after conducting its own investigation. The sanctions themselves were straightforward. As it was the captains of these teams that had knowingly misrepresented the scores when they reported them, they would be the ones punished. USAU suspended them from participation in the first day of Regionals, which included barring them from joining their teams on the sideline or even being on the tournament grounds. They were allowed to rejoin the team on Sunday for all subsequent games. USAU was met immediately with outcry from the teams. Apart from 7 Figures, none of the teams has a coach and each relies on its captains to call lines, formulate their strategy, and motivate the team throughout each game. ROBOS, Robots, Family Style, and 7 Figures weren’t just losing seasoned players: they were losing the very core of their subsequent teams. “In the week leading up to Regionals, the captains found ourselves preoccupied and mentally drained from this sanction. We were unable to focus on preparing our team for the most important tournament of our season. With Kay and I both being starting offensive players, this left a void on our team,” said ROBOS captain Fernando Lugo. But none of those arguments addressed the reason for the initial sanctions. The teams were not being penalized for how the game was played, they were penalized for knowingly misreporting their scores, which the captains admitted was wrong. “We made a mistake in misreporting the score from the final (4th/5th placement) game of SoCal Sectionals, and take ownership of our actions. Accuracy in self-reporting scores is a vital and necessary component of the USAU ranking system, which we all rely upon for bids, seeding, etc., and is also a reflection of the Spirit of the Game,” said Feeney. While it is difficult to confirm, as the exchange happened verbally, both Family Style and ROBOS are adamant that they were told by the tournament director that it was acceptable for them to report the inflated score. Otherwise, they would not have done so. “A captain from each team was approached by members of the tournament staff and told that we could not report that score without violating the rules of USAU and forfeiting our bid to Regionals, but that they would accept a different score,” said the Family Style captains. USAU did not feel that any of the points made by the teams altered the fact that they issued a false score report and thus the sanctions were upheld. How did the Sanctions Impact Regionals? Of the four teams penalized, only 7 Figures made it into the bracket, and that was by the skin of their teeth. Robots, ROBOS, and Family Style all finished day one in the bottom of their pools and did not have a chance to prove themselves on Sunday when their captains returned. This was particularly devastating for Family Style, who had their best ever finish at Sectionals and were looking to make it deep into the bracket at Regionals. With their captains back on the sideline, 7 Figures lost in the quarterfinals 13-7 to Classy and then in the backdoor semifinals 11-10 to BW Ultimate. The tournament’s top three seeds — #2 Mischief, #3 Polar Bears, and #1 Blackbird — qualified for the National Championships that will take place next week in San Diego. Comments on "SoCal Sanctions: Why The Captains Of Four Teams Couldn’t Play Saturday Of Regionals"